HE HAD his own Punch and Judy show as a child, so Richard Cadell was cut out to take control of one of the best known children’s entertainment characters ever – Sooty. The young bear has been around for a staggering 66 years now and Richard’s only 45, but the man with the hand says: “It’s an absolute dream come true for me and I couldn’t ask for anything more. “I’ve been involved in children’s entertainment for as long as I can remember; I’ve always been passionate about it, and really enjoy it. Richard will bring the latest Sooty Show to G Live in Guildford on Thursday (February 19). It’s Sooty’s birthday party and things aren’t going to plan. Sooty and Sweep get messy baking the birthday cake, and will Soo ever decide which dress to wear? 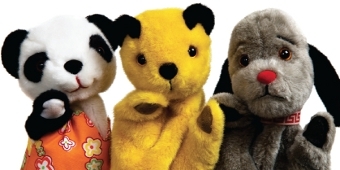 Special party guests include legendary Sooty favourites Butch the bulldog and Ramsbottom the snake. Richard – who took over the role as Sooty’s right-hand man from Matthew Corbett in 2008 – is glad to be getting out and about. He says: “Making the TV shows is great fun, but you can’t beat the reaction you get from a live audience. Working on stage, there’s a chance for some interaction and for the whole family to get involved, and I think it’s important to make sure the adults enjoy the show as much as the children do. As for continuing the legacy of a children’s entertainment legend, Richard says: “I think I’m quite in awe about the whole thing and, obviously, I’m hugely proud to be the man who looks after Sooty. And Richard is planning to stay with Sooty for a long time into the future. “The best thing about my job is that I get to work with Sooty! It’s an absolute dream come true for me and I couldn’t ask for anything more,” he says. “It’s also great to meet people from all walks of life who come up to me after the live shows and share their own childhood memories of Sooty – most of them have children themselves now!